I’ve been having fun viewing some of the video parodies that are being produced by churches nowadays. I guess everyone has seen “Sunday’s Coming” from the folks at North Point http://vimeo.com/11501569 by now so I’ll let chatter on other blogs answer the questions raised there. I recently had to answer some questions about a product when using “Christian” and “Christ Follower” interchangeably so this video series from Community Christian Church is even more applicable to where I am now. For me the terms are more a matter of nuance or flavor and I think I understand why some groups feel more comfortable using one term over the other in certain settings. As a former missionary to Communists and to Muslims, I often substituted terms that were less familiar but more clearly communicated our message. There was sometimes some pushback from those who preferred more traditional language but missionaries in pioneer areas are a bit more experiential by nature. What I didn’t realize in this modern/postmodern struggle in the US is that there are groups on both sides that feel so strongly about some terminology and what it represents that there is some defensiveness associated with it…even with what we call ourselves. While this video is clearly slanted toward one side, it does provoke some interesting thought and questions. So what do you think…Christian or Christ Follower? Why? Does it really matter? Have you ever had an identity crisis? A few days ago at a football practice, I was answering a question that I have answered hundreds of times before: “So, what do you do for a living?” I answered, “I develop small-group discipleship materials for a Christian publishing company” and we went on in the discussion to other topics, mostly about our children. After some time to reflect, I am realizing that this conversation has occurred numerous times and I’m never quite comfortable giving the little word or phrase that people expect to hear. Should I have just said, “I’m an editor” or “I’m a preacher” or “I’m a former missionary” or something altogether different? I must admit that I identify with some of those titles more than others, in ways that bring me varying amounts of comfort. But should I really be comfortable packaging myself so neatly with any of them… and why does this seem to matter so much to men anyway? A lot more questions where those came from! While working in East Asia, I always tried to answer that question in a way that would lead to a spiritual conversation. After all, saying “missionary” or even “Christian” wouldn’t help to define me very well, especially among the Muslims who lived around us. Often I would simply say, “I am a follower of Asa (Jesus), how about you?” This answer usually baffled the listener to some degree so he would ask, “Why are you here?” This led to some wonderful conversations about God, Who He is, and how much He cared about the neighbor to whom I was speaking. So why don’t I answer questions about my profession or identity just as creatively here? Pray for me as I continue this journey, and I’d love to hear some ways that you guys use conversation starters to act as ambassadors for Christ. God seems to be directing a lot of Christians to coffee shops so they can make Jesus famous. The latest statistics are showing that millions of people meet in coffee shops for “spiritual conversations” on a weekly basis. Many of these people will never come to church or an in-house small group meeting. This pre-existing audience in need of Jesus is almost untouched. The groups are already there discussing various belief systems, not necessarily Christianity. Many of these groups are mixed groups made up of agnostics, atheists, Muslims, Buddhists, and people who are simply apathetic about any belief system at all. Joining or starting of group of this nature will allow an individual to insert the name of Jesus into the conversation as well as sharing the Word of God with the group. Simply ask the coffee shop if you can put up an announcement telling what day and time. They will most likely be excited about this as you are bringing consistent business to them. Invite friends from work, people you meet at the grocery store, neighbors of yours, etc…, anyone who you start a conversation with and you sense a chemistry with them. That sense of oneness may well be from God. If you are near condominiums or an apartment building go door to door and place a personal letter from you under the doors of people living in the complex. The letter should be written in very personal language inviting people into the conversation. Don’t give your address though. This could be dangerous. And, if possible, follow-up by going door to door asking people if they got your letter and seeing if they’d like to join you. It would be best if you didn’t go into the apartment or condo even if invited until you know the persons you are talking with. 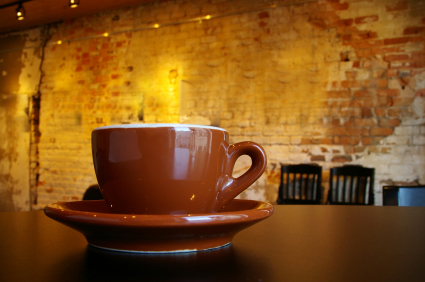 Go to the same coffee shop at least four weeks in a row at the time you plan on having your group meeting. See if there are people who tend to be there consistently on that day and time each week. God may have put a group in place for you already. Something to keep in mind… Since your goal is to make Jesus famous with a group of people who don’t know of His stardom yet, you may want to see what groups are already meeting in the coffee shop near you. Joining a pre-existing group without leading the group will allow you to share the facts found in the Bible and the name of Jesus just as intently. In fact, when telling how His story has changed your story you may be less intimidating as an equal member of the group. We church planters are always looking for locations and situations where we can connect with people in an environment that is comfortable for both parties. This is it! If you decide to make Jesus famous in your local coffee shop by being part of a small group of this kind, Serendipity by LifeWay has a resource written specifically for this setting. The series is titled “Soul Cafe.” A description of these studies reads… “Soul Cafe is a series of open-ended conversations developed to drive you deeper into the story God is revealing. Soul Cafe is not a place for being comfortable or indifferent. It’s personal, penetrating, raw. It isn’t for the religiously refined; rather it’s much better suited for spiritual barbarians.” You can find this resource by going to www.serendipityhouse.com. If you’re a church planter and you want to delve deeply into small groups that transform a community, don’t miss Exponential, one of the best church planting events for 2009.